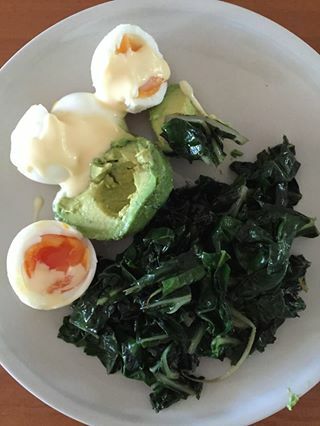 This simple breakfast idea was inspired by Tim Ferris’ slow carb breakfast with spinach and eggs with some avocado and hollandaise sauce thrown in for good measure. Lots of fibre, only two grams of net carbs, truck loads of nutrition and a very gentle impact on blood sugars. Initially when I started running meals through the ranking system I was interested in analysing a wide range of meals and approaches that people had found useful to see what could be learned. In the Four Hour Body Time Ferriss details his concept of a “slow carb” breakfast which he shows you how to make in this video. From the feedback it seems that this approach has worked for a lot of people. Ferriss’ based recipe involves frozen spinach, eggs, flaxseed oil, lemon juice and salsa and all done in the microwave in less than three minutes. Perfect time-efficient bachelor chow! Maybe? Or maybe not? I find Tim’s podcast fascinating (not just about diet). He’s always looking for life hacks and learnings to improve productivity. It’s interesting to note that Tim more recently has transitioned to a more ketogenic dietary approach to improve recovery and mental performance. The base recipe that he discusses in this video isn’t necessarily low carb (with lentils) or high fat (he uses egg whites rather than whole eggs to minimise fat) but it is quite nutrient dense with the eggs and the spinach. Lentils are fairly nutrient dense and cheap which is probably fine if you’re insulin sensitive but not such a great idea if you’re insulin resistant. The nutrient score of Ferriss’ base recipe shown below does well on the nutrient score but not so well on the amino score with only the egg whites rather than whole eggs. Dropping the lentils and using whole eggs rather than egg whites provides a much better protein score and much more diabetic friendly 11% carbs as you can see in the analysis below. The analysis below is with lentils and whole eggs. The lentils option had a lower vitamins and minerals score but a higher amino acid score with a wider range of proteins. In the end, I think the option with spinach, eggs and avocado is a great balance between nutrient density, protein completeness and diabetic friendly high fat / low carbs. I understand that you are analyzing the meal that YOU created, but this post gives the impression that your analysis is for the video’s meal. The video meal has virtually 0 fat. Nobody should be eating that way. This gives the impression you are endorsing a fat phobic, sodium phobic, alcohol for breakfast type of meal. Please clarify. Thanks. I forgot to mention the “corn” and “beans” in the salsa. He’s also calorie phobic and he thinks lentils will give you more “nutrient density.” Then he says he likes to eat about 2 hours later. Well, yeah. That’s about when his blood sugar will start dropping and he’ll have no energy from lack of fat. Marty, either explain why you’d promote this guy or take it down. Your site is usually so good and based on science. Interestingly Tim has gone keto more recently. I’ll write a bit of a story to flesh this one out a bit more comparing the options. Regarding “corn.” Do you disagree with Dr William Davis? And, plant based Omega 3? Only fractionally available compared to animal based Omega 3. Truly, was there anything in that video that was legitimate? I was a bit brief in this recipe post. I have done the analysis on a range of options of this meal. I’m thinking I might do a more extensive write up addressing a bunch of the issues you have raised. I look forward to your swift explication, because as it is, I have a difficult time recommending your website. Updated and elaborated. Let me know what you think.